Amidst a massive breadcrumb recall by the meat and poultry industry due to undeclared allergens, it brings to light exactly how many (if not most) breadcrumbs are made. And most importantly, how clean the ingredient declarations really are. Unfortunately most breadcrumbs are made using day-old and even expired bread from grocery stores that are then ground into crumbs. The core ingredient, bread, may also be from multiple bread manufacturers with a wide range of ingredients, which can directly lead to undeclared allergens. Instead of using standard breadcrumbs we challenge manufacturers to use an authentic Panko. An authentic Panko will perform better than standard breadcrumbs but more importantly all ingredients are fully traceable through the production process. At Upper Crust Enterprises the only thing we take more serious than keeping with traditional Japanese methods is the quality in which we produce our authentic Japanese Panko breadcrumbs. Our Panko breadcrumbs do not contain dairy products and our production line is a dedicated line with the only allergen being wheat, which is properly labeled on the packaging. At Upper Crust Enterprise quality is our utmost priority. Unlike many of the standard brands, we do not buy expired bread from stores and/or bread manufactures, grind them all together to create our Panko. While this might produce a less expensive product, it comes with a price, as seen in the recent recalls. At Upper Crust Enterprises we make our authentic Japanese Panko using a process where we are in full control at every stage. Our short ingredient declaration, allergen control, and a dedicated production line is how we maintain full control over the entire production process – from raw ingredients to the final product. All of our Panko is produced in our own plant and we never subcontract or purchase Panko from other suppliers. Never. Our All Natural Panko has only 4 ingredients. (Wheat flour, Organic cane sugar, Yeast, Sea salt) compare this ingredient list to standard breadcrumbs with over 15 different ingredients plus several allergens. Authentic Panko is also better than standard breadcrumbs in the following ways. Panko is flavor neutral so it does not add a bread flavor to your menu items. Panko with it light texture gives it the ability to absorb more moisture – Making it an excellent binder and mix for many menu items, like meatballs, meatloaf and crab cakes. Authentic Panko provides a better yield with 50% better volume yield at equal weights. Not all Panko is created equal – insist on Upper Crust Enterprises Authentic Panko. We take great pride in making Upper Crust Enterprises Authentic Japanese Panko breadcrumbs right each and every time. 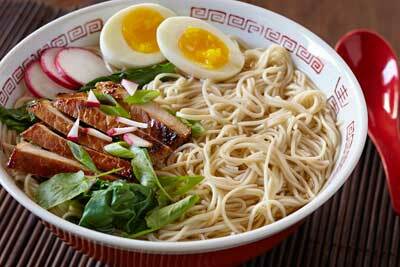 Have a light delicate crispy texture not a hard dense texture. Provide a better yield than competitive Panko or standard breadcrumbs. Please visit the Japanese Panko section of our website to learn more. We invite all professional chefs and food distributors to try a free sample of our Authentic Japanese Panko. Replace your current breadcrumbs with Upper Crust Enterprises Japanese Panko breadcrumbs and win big with your customers. Experience first hand what an Authentic Japanese Panko breadcrumb is and how it will affect your menu. 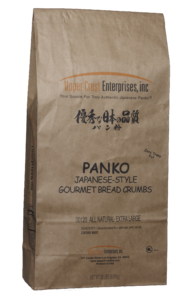 For over 35 years Upper Crust Enterprises has been making Authentic Japanese Panko for customers all over the world. The secret is our traditional Japanese methods in blending, baking, elongated drying process, and grinding of our Authentic Japanese Panko breadcrumbs and our dedication to providing the highest quality control possible. The results are a Panko with a light and airy sliver (flaky) shape crumb. Our Panko will give your menu items a light, crispy texture with a less oily taste and an extra appealing plate presentation. If your restaurant or business is ready to upgrade to a better choice with Authentic Panko, let Upper Crust Enterprise help you select the right Panko breadcrumb to enhance your menu items. Contact us today and receive a complete sample kit of our Authentic Japanese Panko breadcrumbs.